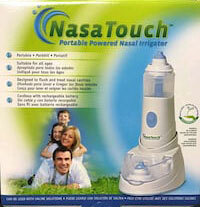 The NasaTouch was a portable atomizer formerly sold by Sinus Dynamics. When Sinus Dynamics went out of business, several of its top employees left to form Woodland Hills Pharmacy. Since the NasaTouch was no longer being manufactured, a new atomizer was needed to deliver the wide range of compounded medications prescribed for intranasal delivery. The RhinoClear was the device chosen by the experienced professionals at Woodland Hills Pharmacy. The RhinoClear is nearly identical to the NasaTouch except it is battery-powered and has a slightly different design. If you are looking for a NasaTouch, it is not likely you will find one since they are not made anymore. However the RhinoClear Sprint is available for purchase on our site and can be shipped to your home immediately. The pharmacists at Woodland Hills Pharmacy recommend the RhinoClear for any medication that requires intranasal atomization. This includes medications used for the Shoemaker Protocol and for treating environmentally acquired illnesses. Just like the NasaTouch, you can take the RhinoClear with you anywhere and use it with either a saline rinse or a medicated solution. It is an easy way to help relieve sinus dryness and congestion from sinusitis on a daily basis. The removable parts of the RhinoClear are washable, and the device has a unique feature that prevents waste from getting into the atomization chamber. Sinus Dynamics was a compounding pharmacy that specialized in medications that are delivered intranasally. Many of the prescriptions that were made by Sinus Dynamics are now made by Woodland Hills Pharmacy. When some of the team from Sinus Dynamics started Woodland Hills Pharmacy, they wanted to find a replacement for the NasaTouch that was as effective and also portable. The RhinoClear is now recommended as the atomizer of choice for nasal administration of medications. The RhinoClear is an automated nasal spray device that sends particles of solution into the nasal passages and sinuses. The spray is propelled by a battery powered motor into a fine mist. Unlike a nebulization device meant for inhalation, the RhinoClear device only targets the nasal passages. When it is used with a prescription medication its effects are meant to be local only, not systemic. That means that the drug is not targeting the entire body, only the nasal passages and sinuses. This entry was posted in NasaTouch and tagged atomization, nasatouch, rhinoclear, sinusitis on November 20, 2018 by whmedsupply. You can see the price and purchase the atomizer by clicking “Buy Now” in the top navigation menu.